إن فندق Beaumaris Bay Motel بموقعه الممتاز في ساوث ايست هو نقطة انطلاق جيدة لنزهاتك في ملبورن. يسهل الوصول إلى هذا الفندق ذو 3 نجوم من المطار، فهو يبعد عنه مسافة 39.4Km فقط. يوفر الفندق بفضل موقعة الجيد وصولاً سهلاً إلى أهم معالم المدينة.
. كما يقدم Beaumaris Bay Motel الكثير من الخدمات لإغناء رحلتك في ملبورن. يمكن لضيوف الفندق الاستمتاع بالميزات التالية على أرض الفندق: تسجيل وصول/خروج سريع, تخزين الأمتعة, واي فاي في المناطق العامة, صف السيارات, خدمة الغرف . لقد جهزت هذه الإقامة الفندقية بعناية فائقة لتوفر مستوى عالي من الراحة. في بعض الغرف يجد النزيل تلفزيون بشاشة مسطحة, حوض الاسترخاء, غرف لغير المدخنين, مكيف هواء, تدفئة. كما أن مجموعة الخدمات الواسعة الموجودة في الفندق لضمان راحتك تترك لك الكثير من الخيارات لقضاء وقتك أثناء فترة إقامتك. إن Beaumaris Bay Motel هو مكان مثالي للمسافرين الذين يتطلعون إلى الراحة والاستجمام في ملبورن. The staff went out of their way to make sure we were comfortable and looked after. I cannot say enough about how much we enjoyed our stay. Being so close to the beach is yet another plus! This is a charming, friendly place that I would recommend to anyone. The restaurant is excellent, but be sure to book ahead of your stay as they fill up regularly. Place is old and tired and in need of renovation. Wifi does not work in the end room. Beaumaris Bay Motel is excellently located, with easy access to the City, south-eastern suburbs and bayside attractions, close to busy Beach Road, but very quiet. Suited us fine as working in the area. Pleasant staff and close to beach for a morning walk. Outdated but comfortable. Staff helpful and friendly. Just 1day night, i dissapointed. Shanpoo and rince was like rock. I couldnt use them. You cant knock the room or management. Its just a shame that you either have to drive or take a taxi if you want do anything. Management very friendly and obliging. Relaxed, quiet, atmosphere, indoor and out, being off the main road down a side street, good sized room, comfortable bed, unfortunately offers "long life milk" in little containers not fresh milk, bathroom quite small and poky, vanity sink cracked around plug hole in my room. Parking is a little restrictive, specially if one owned a 4X4 vehicle. parking is limited, if you arrive later in the afternoon, you have to park your car in the back yard of the old pub over the road, we were lucky, the weather was pleasant, can't comment on the food, the chef was on holidays, kitchen was closed. our stay was a pleasant one the motel is exactly what we expected, clean and close to the restaurant that we were dining at . Nice and comfortable, with very friendly staffs! Close to the beach, great for a beach walk (when the weather is ok)! 80's decor but very well keept, friendly staff and quiet location. 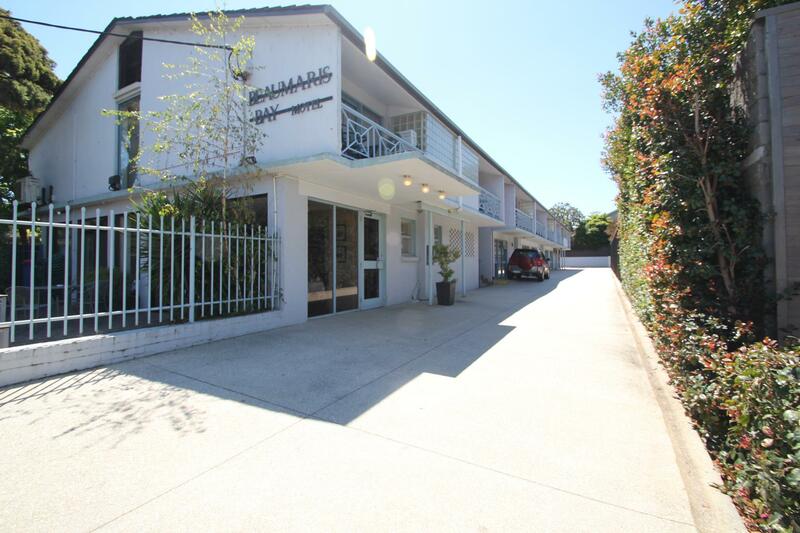 This is a basic motel with good location in Beaumaris.